Easily schedule tests to run on a nightly build or monitor your production app. Set a notification when the run fails. Go to your Runs List, and then navigate to "Scheduled runs" tab. 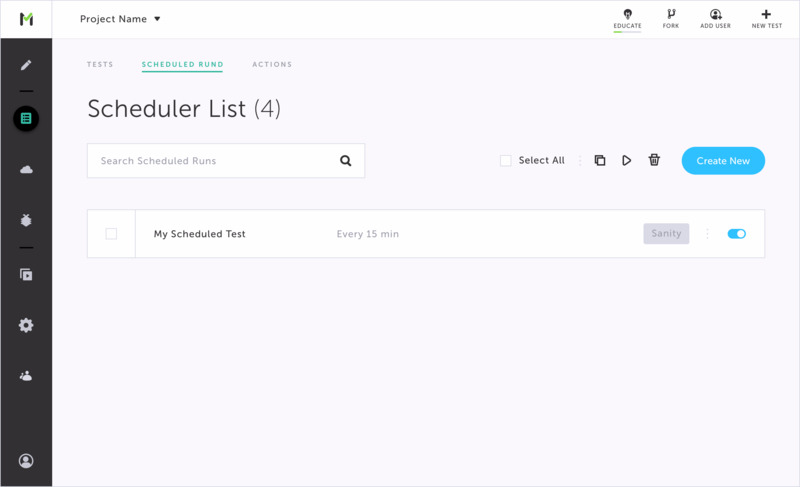 Click "Let's Schedule" to create your first scheduled test run. Test list- Tests to be run. You can choose labels or/and suites. Where to run - The grid you would like to execute your tests on. Read here how to configure your grid. Monitor - Will run the tests on a set interval. Use this option to monitor the health of your application and alert when your service is down. Nightly run - Schedule the tests to run on certain days of the week and the time of day. Use this option to automatically trigger test runs such as nightly regression. 5. Set configuration - set which browsers, operating systems, and resolutions to run your tests on. Choose from your list of configurations or set a new one. 6 Base URL - set the start URL of your web application (e.g. production or staging environment). 7. Notify on error (Send notification on every failure) - Add emails separated by a comma for getting notifications when a run fails. 8. Save your schedule by choosing "OK". Toggle to pause or re-activate the scheduled test suites. Click anywhere of the scheduled test suite to re-edit it. As all other tests - navigate to the "Runs" tab in the sidebar and open the scheduled test run.